QueBIT Blog: Cognos Analytics 11.0.4 Released-It’s a Brave New World Out There! 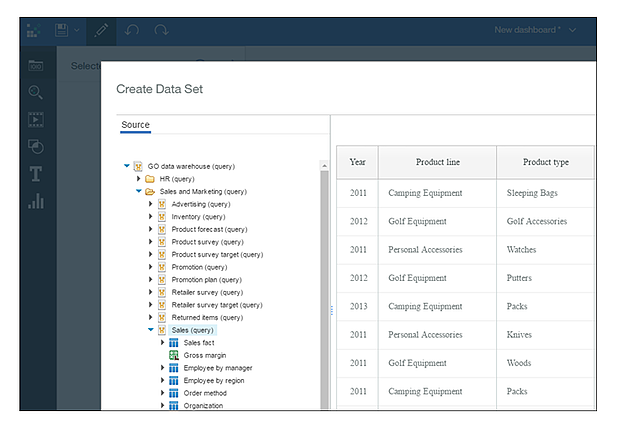 IBM released the latest version of Cognos Analytics (Cognos 11.0.4) on September 16, 2016. This newest version includes some exciting enhancements extending the broad capabilities of the product. It’s available for download from the normal locations. There is a new upgrade process for Cognos Analytics which is different from previous versions. You no longer have to go through a migration/upgrade path, it’s as easy as installing it over what you already have to quickly access all the new features and enhancements. You now have the capability to report off existing Framework Packages in Dashboard using datasets. It’s as easy as selecting an existing Framework Package while in Dashboard, selecting the fields you want to build within the interface and away you go. If for some reason you forgot a field, you can easily edit or refresh the dataset manually via an extended menu. This new feature further enhances the self-service capability Dashboard by extending the reuse of modeled data. The traditional tool for all Cognos developers gets some additional features in 11.0.4 including New Authored drill through in Interactive Viewer, this allows amongst other things a drill-through report to open in the same window but as a different browser tab. IBM are also claiming a performance improvement in Interactive Viewer both in speed and also memory usage. Building on the 11.0.3 release of the Data List, IBM have added the same style properties as are available in a regular List. This completely new functionality - Storytelling leverages the new and improved Dashboard technology of Cognos Analytics 11.0.4, if a widget of a Dashboard is something you want to re-use as part of your Story, select the Pin option to add the widget to your Pin Panel. Once all of your pins are in your My Pins panel it is then easy to add them to your Story. A story has a Timeline allowing you to display a particular page of the story for a set amount of time, it also allows the Storyteller to set the widgets to refresh so that the information contained can be kept current or historical depending on the information, this feature is also available in Dashboard.